Author - Arjun pujari | Dated - 14-03-2019 | Automotive Designer	Car designer career	Car designer School	Automotive design school	Transformation design	Car Design online	Creactive	car design online	Learn car design	car design course. If you want to become a car designer you need to understand the responsibilities of a designer and how you are going to create something which is going to use by millions of people, how well you maintain the quality and function of the car. This post is particularly for people who are obsessed with modern cars like Lamborghini, Ferrari, BMW, Mercedes. The majority of Automotive companies don't require a college degree or certificate to get a job in the design field, but they want a high level of skills and passion in automotive designing. Since car design is a very competitive field, a high level of academic achievement is beneficial when looking for an entry-level job. Students with any background but passion and creative solutions are welcomed into the designing schools. Irrespective of your discipline in your 10+2 you can opt for a bachelor course in automotive designing and students with other bachelor degrees can also go for masters in automotive designing. It is must that student should be capable of showcasing their skillsets and mindsets for designing next-generation cars. Passion and creativity are the two key factors that designers must have to become a successful car designer. Skills can be developed over time but passion can’t. One must have an enormous level of passion and a greater level of patience to become pro car designers, you need to be creative and should have an innovative observation to develop modern cars. During your academics, Attend the workshops and try to get some hand on experience on cars, work on your own projects and dream cars. Attend conferences held by some of the top car brands and magazines, these are the great platforms to build your network in the industry and to get inspiration. Follow the influencers on social media and their work, keep researching on top brands and their upcoming cars this will help you think creatively and keep you updated with the industry trends. Once you get the formal education, work on developing the required advanced skills to design a car in the industry, start making your portfolio and add all the projects that you have worked in your educational time and after start applying for designing internships or jobs. consider taking other online courses to keep you updated with the trends in designing area and to think innovatively. 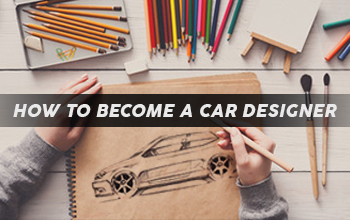 If you are the one who is planning to start your career in designing or willing to do bachelors or masters in automotive designing from any country, it is must that you should prepare for the entrance exam. That's the only way you can proceed with your dreams, in that case, try taking some online courses. This way it will help you understand the designing field, and it is definitely going to be helpful for you, in passing the entrance exam for the design colleges.